sold in flats/boxes of 16 to 18 pieces in assorted colors. 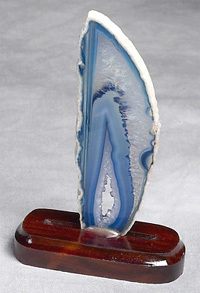 Agate Halves are another addition to our ever growing line of flatted minerals. Each box contains many sizes, shapes, and colors. Agate Halves have a face that is cut and polished but the back is rough. REMINDER: Assorted does not always contain every color. Price is $6.00 pound, sold in 2.5 pound bags. Mixed Color Dyed Agate Tumbled Stone is available in one size. Stones are approx 3/4" to 1". These drilled agate slices are drilled with a 3mm hole in one end. They are available in #00 size. The #00 are $1.25 each and can only be bought in assorted packs of 100. Each bag includes 20 of each of the following colors: Blue, Natural, Pink, Purple & Teal. #00 Slice is approximately 1/8 inch thick .5" to 1" approximate width and 1.5"-2.5" approximate length. Size and shapes of slices will vary. Polished Brazilian Amethyst Crystal Point. Priced at $65.00 per pound and prices can range from $2.00 all the way up to $40.00 each! This is a product of nature so shape and size will vary. Price is $3.00 each, 10pcs per box. These assorted minerals measure approximately 2"H X 2"W. Each box contains 2 each of the following: Amethyst, Citrine, Quartz, Rose Quartz and Black Tourmaline. Sorry, they already come packed in a box. No requests for specific selections will be honored. 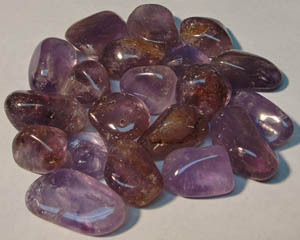 Amethyst Tumbled Stone is available in two sizes: Medium and Large and are sold in 2.5 lb bags. Medium stones are approx 3/4" and Large stones are approx. 1". Rough Single Amethyst Crystals. Packaged in bags of 50 pieces per bag. Price is $3.00 each, sold in boxes of 10 each. 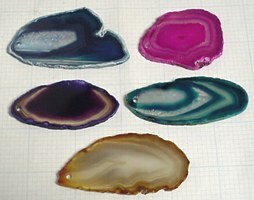 These Agate Thin Slices measure approximately 2"H X 2"W.
Each ASSORTED package MAY contain 2 of each of the following colors: Purple, Pink, Blue, Teal, and Natural. Due to customer request, assorted now may contain more of the best sellers like blue and purple. Assorted might only contain 1 pink or 1 natural. ALL of them are proven sellers. Priced by each, sold in flats of $40.00 per box. 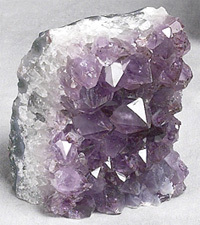 Amethyst Cluster cut flat on bottom to stand up. 3" to 8" tall. Cost $5 to $9 per piece. This distinctive small carved figurines are now available in Amethyst, Clear Quartz, and Rose Quartz. They stand 1" tall and are very appealing to almost everyone. Make stone selection below. NEW STYLE!!! Angel Aura Rose Quartz standing at 1.5" tall. Sold by the each at $6.00 a piece. 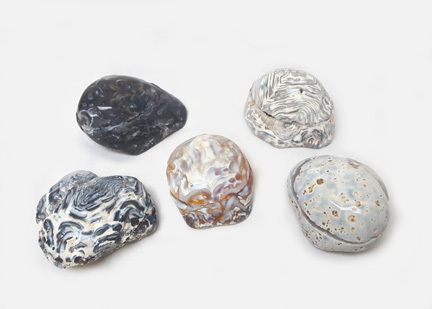 A very popular item with us are these small spherical geodes which have been polished on the outside and sliced in half to produce a unique crystal filled jewelry box for your favorite pair of earrings or special ring. Available in an inch across to about three inches. Prices range between $3 to $25 each.